The lead in the Division II & III race flipped today as the Spartans beat out the Jersey Surf, 95.975 to 95.650. 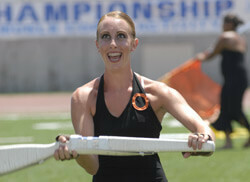 The corps will compete for final bragging rights tomorrow in the Division II&III Finals. "We've been working with the corps on consistency in performance," said Bob Jacobs, Jersey Surf corps director. "Today was a very solid, consistent performance just like we've been doing the whole tour. Tomorrow the goal is to find that one extra, special notch and not only deliver an incredible performance, but also celebrate the fact that this is the last time this show will be performed by this drum corps." Third this afternoon was Teal Sound with a 92.825. The top three corps from each division, plus the next highest six scores overall, earn the right to compete in tomorrow's final competition. 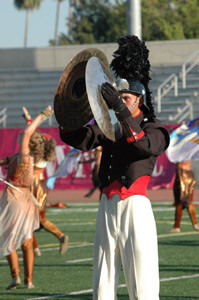 Leading Division III was Memphis Sound. Despite a slight delay getting on the field, the corps lead Fever 91.525 to 89.825. Revolution followed with an 84.750. The other six corps competing tomorrow are, from Division III, Impulse (79.025), Oregon Crusaders (82.600), and Dutch Boy (84.625). The Division II corps competing are Vanguard Cadets (90.650), Fever (89.075), and Blue Devils B (90.650). The Yokohama Scouts, from the International Division, will also perform tomorrow. A large crowd braved the afternoon sun to cheer for the corps, many of which are from California. The corps not advancing to the Finals are Velvet Knights (75.325), Mystikal (74.950), and Gold (74.175).